Take the fun with you wherever you go. Block Rocker Plus has everything you need to transform any get-together into a truly memorable occasion! With its powerful 8-inch 2-way speaker powered by a 100-watt dynamic amplifier, the sound is rich, vibrant and lifelike. Stream music wirelessly from any Bluetooth®-enabled device and manage your tunes easily with play/pause, next/back track controls. The sensitive AM/FM radio with 15 presets is perfect for listening to your favorite station and its rechargeable battery lasts for 35 hours, so the good times keep going. 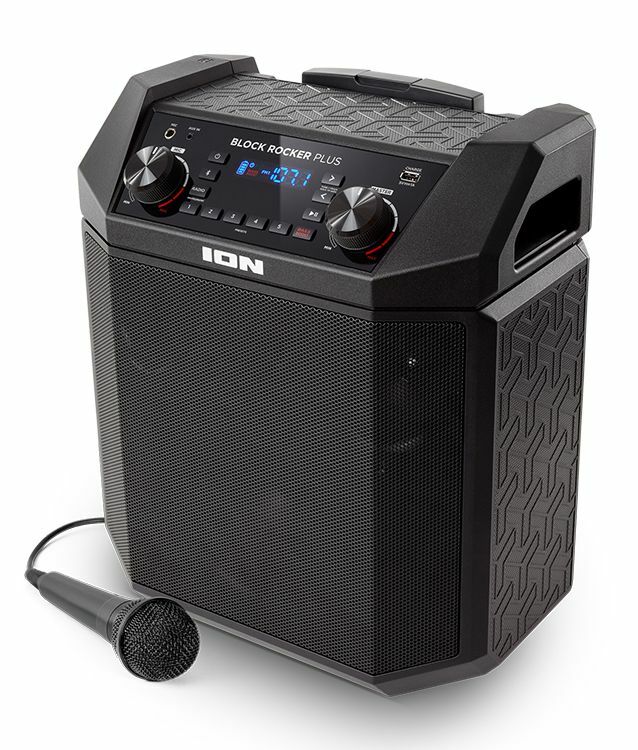 Best of all, Block Rocker Plus is super-convenient and easy-to-use as well as being great-sounding: It has a USB port for keeping your phone charged up and ready-to-go, there’s a 1/8-inch Aux input so you can connect non-Bluetooth devices and Block Rocker Plus is rugged and a snap to take anywhere, thanks to its telescoping handle and built-in wheels. We even include a microphone and cable so you can announce the start time of the next volleyball game!